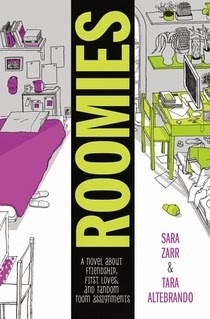 Little Brown Books for Young Readers is hosting a fun "share a roommate story" event today in honor of Sara Zarr and Tara Altebrando's Roomies. I absolutely could not resist joining in because really. Is there a better subject than roommates? Also, while I haven't finished the book, I'm reading it and loving it and hope to have a real review, soon! I'll never forget how when we first arrived at school she cried and cried while saying goodbye to her family and my mom ran something up to my room and I was like "bye!" and she was stunned and like, "that's it?" My family has never been sentimental! She left school after a semester which brought in my second roommate a girl who competed in beauty pageants but had gained some weight and desperately needed to lose it. Also, she was was super neat while I'm a bit on the cluttered side ;). So while in theory we got along we actually had nothing in common and she ended up leaving school as well! But nothing really compares to the random assignment of English speaking teachers from different countries and cultures to a flat in Japan. I know it's not the same as sharing a room, but sharing a tiny apartment is still stressful, especially when people have differing values and living preferences all over the place. I only ever had one truly bad roommate...I got along quite well with the others and even became really close to one. But after my first flatmate moved out, we got a new girl in and the apartment sort of exploded. She never wanted to take her turn to clean or take the trash out or buy the shared supplies. Her boyfriend was over ALL the time and they were not quiet if you get my drift. Having three girls on varying work schedules was hard enough in our small place, but add a fourth non-paying person and the burden was too much! She also went in our rooms and messed in our stuff without asking, ate our food, etc. It was such a relief when she moved. The funny thing about living with people is that you feel like you can never be too confrontational because they will always be there and they can do stuff to you--like poison you or something. We coped the best we could. Luckily, I think it really worked to make my other roommate and me closer than ever! So yeah, roommates. You just never really know. I tend to feel like for the most part I've had some great ones, but I've definitely had my fair share of living with difficult people! Roomies is available now and I have a copy to give away to someone living in the US. To enter just fill out the form below by January 15th. Also! Sara and Tara are going on tour. Maybe they are coming near you? Check it out! About Roomies: The countdown to college has begun.